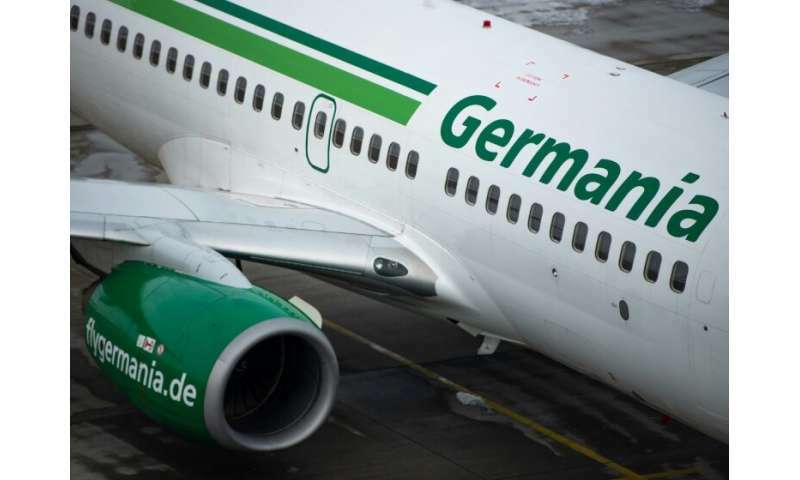 Budget airline Germania filed for bankruptcy on Tuesday, becoming the latest low-cost carrier to go under after the highly competitive industry suffered from rising fuel prices last year. Here is some background on the challenges plaguing the sector. This year has not started much better with Germania, which transported more than four million passengers a year, not only filing for bankruptcy but cancelling all flights with immediate effect. The Berlin-based airline, which flew mainly Mediterranean, North African and Middle Eastern holiday routes for German sun-seekers on package trips, said it "ultimately failed to successfully complete our financing efforts to meet short-term liquidity needs". Other ailing airlines have only narrowly escaped folding this year, such as the British Flybe, which a consortium led by Virgin Atlantic is bidding to buy for just one pence per share. Even the Irish budget airline Ryanair—the industry leader—has felt the pressure, revealing on Monday it would restructure after a net loss of 20 million euros ($22 million) in the last three months of 2018, its first quarterly loss since 2014. Competition is fierce for short-haul flights in Europe as airlines drop prices hoping to win over thrifty holiday seekers, pushing their profit margins lower. The average cost of a Ryanair flight, for example, is now below 30 euros. Olivier Fainsilber, aviation analyst at consultancy Oliver Wyman, said it was a time of "unrestrained competition" after relatively low barriers allowed many new companies to enter the market. "Economic Darwinism has always been strongly at work in the airline sector," he said. "To be successful you must be very efficient." Companies have also faced stiff competition from low-cost subsidiaries set up by big operators such as British Airways parent company IAG, which has also ventured into budget long-haul flights. Sebastian Zank, an analyst at Scope Ratings, said Germania's collapse "shows again that to survive in Europe's crowded sector, carriers need to be niche players or have an extensive network as is the case with budget leader Ryanair and multi-brand operators like Lufthansa Group and IAG". "The marginalisation of smaller airlines and more industry consolidation appear inevitable," he added. Surging oil prices have added to the industry's woes. At the height of the spike in July 2018, the price of an oil barrel nearly reached $75—up from $50 at the same time the previous year. "There will always be highs and lows, but it is when a period gets tense that we see who manages to hold on," said Fainsilber. "You need to have a little war chest." European airlines were also hit by a drop in the euro, which lost five percent against the dollar in 2018. But the outlook for this year is not so bleak, with oil prices ebbing and passenger numbers expected to remain stable. "There is also growth, it's just that the incline is not as steep as in the past," said Fainsilber.